Bedford, NH — Normandeau Associates, Inc. has been awarded a five-year IDIQ contract with the Bureau of Ocean Energy Management (BOEM) to perform ecological baseline studies on the US Outer Continental Shelf (OCS) in support of offshore renewable energy development. The focus will be on aerial digital survey and boat-based visual surveys for birds, marine mammals, and sea turtles as well as passive acoustic monitoring for marine mammals. Our team members include our partners APEM Inc, Continental Shelf Associates, and Azura, Inc. The first task is to conduct a one-year aerial digital survey of the OCS off North and South Carolina, covering an area of nearly 10,000 square nautical miles. The work will be conducted by the Normandeau/APEM team who are also conducting a similar study in the New York Bight for NYSERDA. 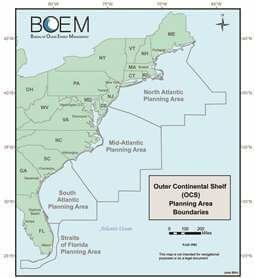 To date, BOEM has held one lease sale in this area, awarding a 122,405 acre lease to Avangrid off Kitty Hawk, NC. State Task Forces are continuing to evaluate other potential lease areas off the Carolinas and data from this study will enhance that process.